On average, women have a higher body fat percentage than men. This is completely normal, as women need more body fat to menstruate and for their bodies to prepare for children. As women age, body fat tends to increase as muscle mass decreases. While some fat fat is healthy, too much or too little can lead to health problems. Talk to your doctor or another health professional to determine if you have a healthy amount of body fat. As of publication in September 2000 of an article in “American Journal of Clinical Nutrition,” there was no agreed-upon standard of healthy percentage body fat. Nonetheless, the American Council on Exercise (ACE) gives a guideline you can follow depending on your fitness level. According to ACE's standards, it is normal for female athletes to have between 14 and 20 percent body fat, for fit women to fall between 21 and 24 percent and for average women to have between 25 and 31 percent body fat. The American Council on Exercise categorizes you as obese if your fat percentage falls anywhere above 32 percent. On the other end, a woman needs at least 10 to 13 percent body fat or she does not have enough essential fat to regulate many bodily systems. There are numerous methods a health professional can use to measure your body fat, including underwater weighing, bioelectrical impedance, isotope dilution and dual-energy X-ray absorptiometry. However, these tests are often expensive and are also not 100 percent accurate. The body mass index, or BMI, based on your height and weight, is a simpler measurement. 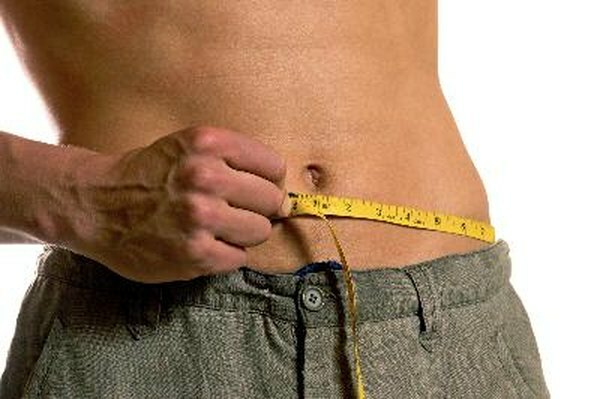 Although BMI does not directly measure body fat, the result is usually in line with those from the other measurements. Contact your doctor or a health professional for help with any of these methods. Just as with body fat percentage, health experts have not agreed on a standard for losing excess fat. Nonetheless, many experts believe you can safely achieve fat loss of 1 percent each month with diet and exercise. Since the body fat measurements are flawed, it is important to have your body fat tested again every couple months. You need a combination of diet, aerobic exercise and strength training to lose body fat, since weight loss through diet alone burns muscle as well as fat.